A Spanish photographer who was kidnapped in the Gaza Strip has been released, it has been confirmed. 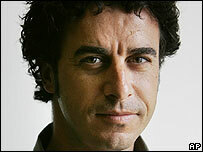 Emilio Morenatti, 37, who works for the Associated Press news agency, spent less than a day in captivity. He was seized by gunmen who emerged from a white Volkswagen car, after he left his flat in Gaza City. The photographer, who has been taken by Fatah officials to the office of Palestinian President Mahmoud Abbas, said he was tired but unharmed. It is still not clear who held him or what their motive had been. A Hamas spokesman also condemned the kidnap. He was said to be on his way to an early-morning assignment. Over the last two years or so, there have been about 24 cases of foreigners being kidnapped in the Gaza Strip. Their captors have normally been disaffected militant groups who use hostages as bargaining chips in disputes with the local authorities, BBC Gaza correspondent Alan Johnston says. The foreigners were usually released quickly and unharmed. But the last kidnapping involving two journalists from the US Fox news organisation was a much more prolonged affair. The pair were held by a militant Islamist Jihadi-style group that at times threatened to kill them. The captives were forced to convert to Islam and denounce the West in a video before eventually being freed. Ghazi Hamad, spokesman for the Hamas-led Palestinian government, condemned the kidnapping, saying it "damages the reputation of the Palestinian people". "The government will take all steps to ensure his release," he said.